Not to be confused with Gospel of James. 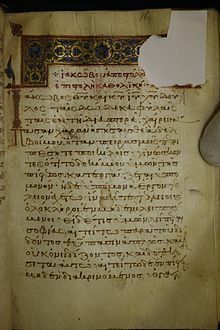 The Epistle of James (Ancient Greek: Ἰάκωβος, translit. 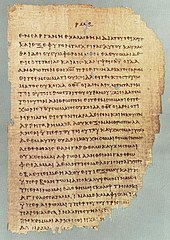 Iakōbos), the Book of James, or simply James, is one of the 21 epistles (didactic letters) in the New Testament. The author identifies himself as "James, a servant of God and of the Lord Jesus Christ," who is writing to "the twelve tribes scattered abroad" (James 1:1). The epistle is traditionally attributed to James the brother of Jesus (James the Just), and the audience is generally considered to be Jewish Christians, who were dispersed outside Palestine. Framing his letter within an overall theme of patient perseverance during trials and temptations, James writes to encourage believers to live consistently with what they have learned in Christ. He wants his readers to mature in their faith in Christ by living what they say they believe. He condemns various sins, including pride, hypocrisy, favouritism, and slander. He encourages and implores believers to humbly live by godly, rather than worldly wisdom and to pray in all situations. Within the New Testament canon, the Epistle of James is noteworthy because it makes no explicit reference to the death, resurrection, or divine sonship of Jesus. It refers to Jesus twice, as "the Lord Jesus Christ" and as "our glorious Lord Jesus Christ" (James 1:1, 2:1). the letter comprises material originally from James but reworked by a later editor. The writer refers to himself only as "James, a servant of God and of the Lord Jesus Christ. "[Jas 1:1] As many as six different men in the Bible are named James. Jesus had two apostles named James: James, the son of Zebedee and James, the son of Alphaeus, but it is unlikely that either of these wrote the letter. According to the Book of Acts, James, the son of Zebedee, was martyred about 44 AD. That would be very early for him to have been the writer. The similarity of his alleged martyrdom to the stoning of James the Just, has led some scholars, such as Robert Eisenman and James Tabor, to assume that these "two Jameses" were one and the same. This identification of James of Alphaeus with James the Just (as well as James the Less) has long been asserted, as evidenced by their conflation in Jacobus de Voragine's medieval haliography The Golden Legend. The writer of the letter of James identifying himself as "a servant/slave of God and of the Lord Jesus Christ" is much the same as the author of the Epistle of Jude did by calling himself "a slave of Jesus Christ, but a brother of James" (Jas 1:1; Jude 1). Furthermore, the salutation of his letter concludes with the term “greetings" (Greek χαίρειν), much like the letter on circumcision that was sent to the congregations. In the latter instance it was apparently Jesus's brother, James, who spoke prominently in the assembly of "the apostles and the older men" at Jerusalem. Some have said the authorship of this epistle points to James, the brother of Jesus, to whom Jesus evidently had made a special appearance after his resurrection described in the New Testament as this James was prominent among the disciples. From the middle of the 3rd century, patristic authors cited the Epistle as written by James, the brother of Jesus and a leader of the Jerusalem church. Not numbered among the Twelve Apostles unless he is identified as James the Less, James was nonetheless a very important figure: Paul described him as "the brother of the Lord" in Galatians 1:19 and as one of the three "pillars of the Church" in 2:9. Pseudonymous authorship (3 above) implies that the person named "James" is respected and doubtless well known. Moreover, this James, brother of Jesus, is honored by the epistle written and distributed after the lifetime of James, the brother of Jesus. John Calvin and others suggested that the author was the Apostle James, son of Alphaeus, who is referred to as James the Less. The Protestant reformer Martin Luther denied it was the work of an apostle and termed it an "epistle of straw" as compared to some other books in the New Testament, partly because of the conflict he thought it raised with Paul on the doctrine of justification (see below). The Holy Tradition of the Orthodox Church teaches that the Book of James was "written not by either of the apostles [sic], but by the “brother of the Lord” who was the first bishop of the Church in Jerusalem (see Acts 15, Galatians 1:19)." The first page of James in Minuscule 319, a Greek minuscule manuscript of the New Testament. The author introduces himself merely as "a servant of God and of the Lord Jesus Christ" without invoking any special family relationship to Jesus. The cultured Greek language of the Epistle, it is contended, could not have been written by a Jerusalem Jew. Some scholars argue for a primitive version of the letter composed by James and then later polished by another writer. The epistle was only gradually accepted into the canon of the New Testament. Some see parallels between James and 1 Peter, 1 Clement, and the Shepherd of Hermas and take this to reflect the socio-economic situation Christians were dealing with in the late 1st or early 2nd century. It thus could have been written anywhere in the Empire that Christians spoke Greek. There are some scholars who argued for Syria. "The Letter of James also, according to the majority of scholars who have carefully worked through its text in the past two centuries, is among the earliest of New Testament compositions. It contains no reference to the events in Jesus' life, but it bears striking testimony to Jesus' words. Jesus' sayings are embedded in James' exhortations in a form that is clearly not dependent on the written Gospels." If written by James the brother of Jesus, it would have been written sometime before AD 69 (or AD 62), when he was martyred. Jerusalem would also be the place of writing. The earliest extant manuscripts of James usually date to the mid-to-late 3rd century. James is considered New Testament wisdom literature: "like Proverbs and Sirach, it consists largely of moral exhortations and precepts of a traditional and eclectic nature." The content of James is directly parallel, in many instances, to sayings of Jesus found in the gospels of Luke and Matthew, i.e., those attributed to the hypothetical Q Source. Compare, e.g., "Do not swear at all, either by heaven...or by the earth....Let your word be 'Yes, Yes' or 'No, No'; anything more than this comes from the evil one" (Matthew 5:34, 37) and "...do not swear either by heaven or by earth or by any other oath, but let your 'Yes' be yes and your 'No' be no, so that you may not fall under condemnation" (James 5:12). According to James Tabor, the epistle of James contains "no fewer than thirty direct references, echoes, and allusions to the teachings of Jesus found in the Q source." Some view the epistle as having no overarching outline: "James may have simply grouped together small 'thematic essays' without having more linear, Greco-Roman structures in mind." That view is generally supported by those who believe that the epistle may not be a true piece of correspondence between specific parties but an example of wisdom literature, formulated as a letter for circulation. The Catholic Encyclopedia says, "the subjects treated of in the Epistle are many and various; moreover, St. James not infrequently, whilst elucidating a certain point, passes abruptly to another, and presently resumes once more his former argument." Others view the letter as having only broad topical or thematic structure. They generally organize James under three (Ralph Martin) to seven (Luke Johnson) general key themes or segments. James, like the gospel writers, can be seen as a purposeful theologian, carefully weaving his smaller units together into larger fabrics of thought and using his overall structure to prioritize his key themes. The third view of the structuring of James is a historical approach that is supported by scholars who are not content with leaving the book as "New Testament wisdom literature, like a small book of proverbs" or "like a loose collection of random pearls dropped in no particular order onto a piece of string." A fourth group uses modern discourse analysis or Greco-Roman rhetorical structures to describe the structure of James. Understanding the circumstances of James' writing helps scholars better understand James' organization of the letter. They view the epistle as having a legitimate purpose for its composition, a response to the suffering of its recipients. A 2013 journal article explores a violent historical background behind the epistle and offers the suggestion that it was indeed written by James, the brother of Jesus, and it was written before AD 62, the year he was killed. The 50s saw the growth of turmoil and violence in Roman Judea, as Jews became more and more frustrated with corruption, injustice and poverty. It continued into the 60s, four years before James was killed. War broke out with Rome and would lead to the destruction of Jerusalem and the scattering of the people. The epistle is renowned for exhortations on fighting poverty and caring for the poor in practical ways (1:26–27; 2:1-4; 2:14-19; 5:1-6), standing up for the oppressed (2:1-4; 5:1-6) and not being "like the world" in the way one responds to evil in the world (1:26-27; 2:11; 3:13-18; 4:1-10). Worldly wisdom is rejected and people are exhorted to embrace heavenly wisdom, which includes peacemaking and pursuing righteousness and justice (3:13-18). This approach sees the epistle as a real letter with a real immediate purpose: to encourage Christian Jews not to revert to violence in their response to injustice and poverty but to stay focused on doing good, staying holy and to embrace the wisdom of heaven, not that of the world. 14What good is it, my brothers, if someone says he has faith but does not have works? Can that faith save him?15If a brother or sister is poorly clothed and lacking in daily food, 16and one of you says to them, “Go in peace, be warmed and filled,” without giving them the things needed for the body, what good is that? 17So also faith by itself, if it does not have works, is dead. 18But someone will say, “You have faith and I have works.” Show me your faith apart from your works, and I will show you my faith by my works. 19You believe that God is one; you do well. Even the demons believe—and shudder! 20Do you want to be shown, you foolish person, that faith apart from works is useless? 21Was not Abraham our father justified by works when he offered up his son Isaac on the altar? 22You see that faith was active along with his works, and faith was completed by his works; 23and the Scripture was fulfilled that says, “Abraham believed God, and it was counted to him as righteousness”—and he was called a friend of God. 24You see that a person is justified by works and not by faith alone. 25And in the same way was not also Rahab the prostitute justified by works when she received the messengers and sent them out by another way?26For as the body apart from the spirit is dead, so also faith apart from works is dead. That passage has been cited in Christian theological debates, especially regarding the doctrine of justification. Gaius Marius Victorinus (4th century) associated James's teaching on works with the heretical Symmachian sect, followers of Symmachus the Ebionite, and openly questioned whether James' teachings were heretical. This passage has also been contrasted with the teachings of Paul the Apostle on justification. Some scholars even believe that the passage is a response to Paul. One issue in the debate is the meaning of the Greek word δικαιόω (dikaiόō) 'render righteous or such as he ought to be', with some among the participants taking the view that James is responding to a misunderstanding of Paul. Paul was dealing with one kind of error while James was dealing with a different error. The errorists Paul was dealing with were people who said that works of the law were needed to be added to faith in order to help earn God's favor. Paul countered this error by pointing out that salvation was by faith alone apart from deeds of the law (Galatians 2:16; Romans 3:21-22). Paul also taught that saving faith is not dead but alive, showing thanks to God in deeds of love (Galatians 5:6 ['...since in Christ Jesus it is not being circumcised or being uncircumcised that can effect anything - only faith working through love.']). James was dealing with errorists who said that if they had faith they didn't need to show love by a life of faith (James 2:14-17). James countered this error by teaching that faith is alive, showing itself to be so by deeds of love (James 2:18,26). James and Paul both teach that salvation is by faith alone and also that faith is never alone but shows itself to be alive by deeds of love that express a believer's thanks to God for the free gift of salvation by faith in Jesus. 14Is anyone among you sick? Let him call for the elders of the church, and let them pray over him, anointing him with oil in the name of the Lord. 15And the prayer of faith will save the one who is sick, and the Lord will raise him up. And if he has committed sins, he will be forgiven. G. A. Wells suggested that the passage was evidence of late authorship of the epistle, on the grounds that the healing of the sick being done through an official body of presbyters (elders) indicated a considerable development of ecclesiastical organisation "whereas in Paul's day to heal and work miracles pertained to believers indiscriminately (I Corinthians, XII:9)." The Epistle was first explicitly referred to and quoted by Origen of Alexandria, and possibly a bit earlier by Irenaeus of Lyons as well as Clement of Alexandria in a lost work according to Eusebius, although it was not mentioned by Tertullian, who was writing at the end of the Second Century. It is also absent from the Muratorian fragment, the earliest known list of New Testament books. The Epistle of James was included among the twenty-seven New Testament books first listed by Athanasius of Alexandria in his Thirty-Ninth Festal Epistle (AD 367) and was confirmed as a canonical epistle of the New Testament by a series of councils in the Fourth Century. Today, virtually all denominations of Christianity consider this book to be a canonical epistle of the New Testament. In the first centuries of the Church the authenticity of the Epistle was doubted by some, including Theodore, Bishop of Mopsuestia in Cilicia. Because of the silence of several of the western churches regarding it, Eusebius classes it among the Antilegomena or contested writings (Historia ecclesiae, 3.25; 2.23). Jerome gives a similar appraisal but adds that with time it had been universally admitted. Gaius Marius Victorinus, in his commentary on the Epistle to the Galatians, openly questioned whether the teachings of James were heretical. Its late recognition in the Church, especially in the West, may be explained by the fact that it was written for or by Jewish Christians, and therefore not widely circulated among the Gentile Churches. There is some indication that a few groups distrusted the book because of its doctrine. In Reformation times a few theologians, most notably Martin Luther in his early career, argued that this epistle should not be part of the canonical New Testament. Martin Luther's description of the Epistle of James changes. In some cases, Luther argues that it was not written by an apostle; but in other cases, he describes James as the work of an apostle. He even cites it as authoritative teaching from God and describes James as "a good book, because it sets up no doctrines of men but vigorously promulgates the law of God." Lutherans hold that the Epistle is rightly part of the New Testament, citing its authority in the Book of Concord; however, it remains part of the Lutheran antilegomena. ^ Davids, Peter H (1982). The Epistle of James: A Commentary on the Greek Text. New International Greek Testament Commentary (Repr. ed.). Grand Rapids, Mich.: Eerdmans. ISBN 0802823882. ^ Evans, Craig A (2005). Craig A Evans (ed.). Bible Knowledge Background Commentary: John, Hebrews-Revelation. Colorado Springs, Colo.: Victor. ISBN 0781442281. ^ a b c Camerlynck, Achille (1910). "Epistle of St James". The Catholic Encyclopedia. Retrieved 16 May 2012. ^ a b "Letters of Saint James." Orthodox Church in America, OCA, (n.d.). Accessed 11 Dec. 2018. ^ Robert J. Foster (23 September 2014). The Significance of Exemplars for the Interpretation of the Letter of James. Mohr Siebeck. p. 8. ISBN 978-3-16-153263-4. ^ Dan G. McCartney (1 November 2009). James. Baker Academic. pp. 14–. ISBN 978-0-8010-2676-8. ^ a b McCartney, Dan G (2009). Robert W Yarbrough and Robert H Stein (ed.). Baker Exegetical Commentary on the New Testament: James. Grand Rapids: Baker Academic. ISBN 0801026768. ^ Tabor, James D (2006). The Jesus Dynasty: A New Historical Investigation of Jesus, His Royal Family, and the Birth of Christianity. Simon & Schuster. ISBN 0-7432-8723-1. ^ de Voragine, Jabobus (1275). "The Life of S. James the Less". Fordham.edu. ^ Cf. James 1:1 and Acts 15:23. ^ Adam Clarke,1821, commentary on 5:13, 22, 23. ^ Moo, Douglas J (2000). D A Carson (ed.). The Letter of James. Grand Rapids: Wm B Eerdmans Publishing co. ISBN 0802837301. ^ Bechtel, Florentine. "The Brethren of the Lord". Catholic Encyclopedia. Retrieved 16 May 2012. His identity with James the Less (Mark 15:40) and the Apostle James, the son of Alpheus (Matthew 10:3; Mark 3:18), although contested by many Protestant critics, may also be considered as certain. ^ Shillington, V. George (2015). James and Paul: The Politics of Identity at the Turn of the Ages. Minneapolis: Fortress Press. pp. 65–96. ISBN 978-1-4514-8213-3. ^ "History of the Christian Church, book 7, chapter 4". ^ "Epistle of James". Early Christian Writings. Retrieved 16 May 2012. ^ a b John Barton and John Muddiman, ed. (2001). The Oxford Bible Commentary. Oxford: Oxford University Press. p. 1256. ISBN 0198755007. ^ Johnson, Luke Timothy (1996). The Real Jesus. HarperOne. p. 121. ISBN 0060641665. ^ Laws, Sophie (1993). The HarperCollins Study Bible. San Francisco: HarperCollins Publishers. p. 2052. ISBN 0060655267. ^ Tabor, James D. (2012). Paul and Jesus: How the Apostle Transformed Christianity. New York: Simon & Schuster. p. 41. ISBN 978-1-4391-2332-4. ^ a b Blomberg, Craig (2008). James. Grand Rapids: Zondervan. p. 23. ISBN 9780310244028. ^ Martin, Ralph (1988). James. Waco, TX: WBC. p. xcviii - civ. ^ Johnson, Luke (2000). The Letter of James. Grand Rapids: Pillar. pp. 11–16. ^ Some numerous writers and commentators assume so, like William Barclay, The Daily Study Bible, rev. ed., 17 vols. (Philadelphia: The Westminster Press, 1976), Vol 14, The Letters of James and Peter, p. 28. ^ Taylor, Mark (2006). A Linguistic Investigation into the Discource Structure of James. London: T&T Clark. ISBN 9780310244028. ^ Eberhard Nestle, ed. (2011). Greek New Testament With Revised Concise Greek-English Dictionary (4th Revised ed.). Hendrickson Publishers. ISBN 1598567209. ^ On the death of James, see Josephus Antiquities, 20.9.1 and Eusebius II.23.1-18. ^ Numerous studies argue for a letter- structure to James. See, for example, Euan Fry, "Commentaries on James, I and 2 Peter, and Jude," The Bible Translator, 41 (July 1990): 330, and F.O. Francis, "The Form and Function of the Opening and Closing Paragraphs of James and I John," ZNW 61 (1970):110-126. ^ James 2:14-26, English Standard Version. ^ McKnight, Scot (2011). The Letter of James. The New International Commentary on the New Testament. Grand Rapids, Michigan: William B. Erdmans. pp. 259–263. ISBN 978-0-8028-2627-5. ^ "Dikaioo". Greek Lexicon. Retrieved 16 May 2012. ^ Martin, D. 2009. New Testament History & Literature: 18. Arguing with Paul. Yale University. ^ "The Theological Virtues: 1815". Catechism of the Catholic Church. The gift of faith remains in one who has not sinned against it. But 'faith apart from works is dead':[Jas 2:26] when it is deprived of hope and love, faith does not fully unite the believer to Christ and does not make him a living member of his Body. ^ Schaff, Philip (1877). "The Synod of Jerusalem and the Confession of Dositheus, A.D. 1672: Article XIII". Creeds of Christendom. Harper & Brothers. Man is justified, not by faith alone, but also by works. ^ Calvin, John. "James 2:20–26". Commentaries on the Catholic Epistles. When, therefore, the Sophists set up James against Paul, they go astray through the ambiguous meaning of a term. ^ "Faith and Works". WELS Topical Q&A. Wisconsin Evangelical Lutheran Synod. Archived from the original on 20 December 2013. Retrieved 30 September 2015. ^ a b Wells, George Albert (1971). The Jesus of Early Christians. London: Pemberton. p. 152. ISBN 0301710147. ^ Davis, Glenn (2010). "Irenaeus of Lyons". The Development of the Canon of the New Testament. Retrieved 16 May 2012. ^ Griggs, C Wilfred (1991). Early Egyptian Christianity (2nd ed.). Leiden: Brill Academic Publisher. p. 173. ISBN 9004094075. ^ 1958-, Cooper, Stephen Andrew,. Marius Victorinus' "Commentary on Galatians" : introduction, translation, and notes. Oxford University Press. pp. 265–266. ISBN 0198270275. OCLC 878694940. ^ Schaff, Philip. History of the Reformation. The most important example of dogmatic influence in Luther’s version is the famous interpolation of the word alone in Rom. 3:28 (allein durch den Glauben), by which he intended to emphasize his solifidian doctrine of justification, on the plea that the German idiom required the insertion for the sake of clearness.464 But he thereby brought Paul into direct verbal conflict with James, who says (James 2:24), "by works a man is justified, and not only by faith" ("nicht durch den Glauben allein"). It is well known that Luther deemed it impossible to harmonize the two apostles in this article, and characterized the Epistle of James as an "epistle of straw," because it had no evangelical character ("keine evangelische Art"). ^ Stonehouse, Ned B (1957). Paul Before the Areopagus. pp. 186–197. ^ "Lutheran Church - Missouri Synod - Christian Cyclopedia".